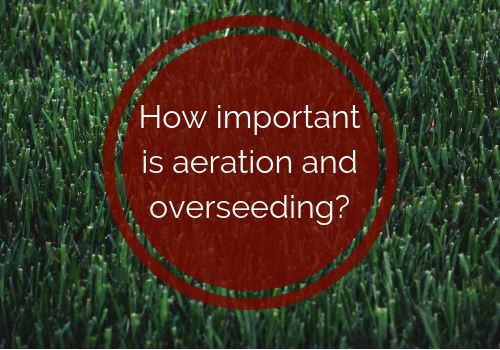 How Important is Aeration and Overseeding? All those activities from the spring and summer months can be really tough on your lawn. To keep your lawn looking great all year round, this is the time of year it’s important to consider annual maintenance. When considering larger annual yard maintenance, often people worry more about shrubs, flowers, pool, or patio maintenance instead of the lawn. When they do consider the lawn it’s usually simple mowing. To be sure your lawn is at its best you should maintenance it at least annually (bi-annually if you tend to have lots of foot traffic). The two most important forms of annual lawn care are lawn aeration and overseeding. Lawn aeration is one of the most common and important forms lawn maintenance. When aerating a lawn a specialized machine is used to punch holes in the soil to loosen it. This then allows the soil to breathe easily allowing nutrients, oxygen, and water into your lawn. To keep your lawn looking sharp year-round, we recommend that you aerate your lawn at least once a year – especially if your lawn is walked on or used often as this compacts the soil more. The best time for aerating your lawn is in the fall, as the combination of cool air and warm soil are the optimal conditions for grass to grow. Be sure to aerate your lawn well before the winter freeze to ensure that the grass is fully grown before the cold sets in. The other time of the year that’s good for aerating your lawn is the early spring after the ground thaws. It’s important to have already mowed your lawn a few times before aerating at this time of the year to make sure that your lawn can handle the process well. Overseeding is the process of adding grass seeds on top of existing grass, there are three basic steps to overseeding; prep, seeding, and watering. We highly recommend that you aerate your lawn before overseeding to ensure that the soil is at its best to receive new seeds. When preparing your lawn for overseeding you’re going to want to start by mowing at the lowest setting. After mowing, be sure to pickup the grass clippings to ensure that the seeds have as direct contact to the soil as possible, as well as plenty of access to unobstructed water and sunlight. After this it’s time to spread the seeds! This is done with a spreader. Spreaders come in various sizes, from handheld spreaders to larger wheeled broadcast spreaders. Which one you use will depend on the size of your lawn. Once the seeding is done you’re going to want to heavily water your lawn to ensure that the grass seeds wash into the slits. For the next two weeks water lightly but be sure to soak, after this a regular watering schedule should suffice to ensure that your lawn grows into one you can be proud of. Remember, there’s nothing like a beautiful green lawn with healthy grass to remind you of how beautiful your landscape is. So give us a call at (636) 688-6647 and let us help you ensure that your yard is as crisp and green as you deserve!